Remember in Elementary School where instead of celebrating your significant other (because you're like seven) you would gift everyone in the classroom Valentine's Day cards and perhaps even those cool, holographic stickers? Ah, the good ol' days. For this category, I’m going a decade or so back to Fullmetal Alchemist. 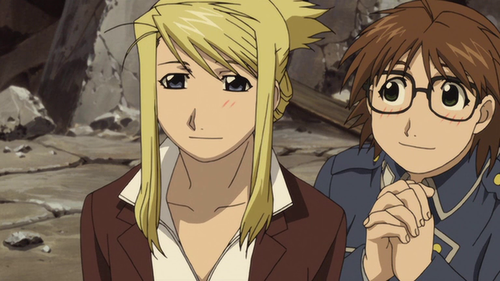 One of my favorite relationships in the series—and there are many—involves tinkerer Winry Rockbell and bookworm Sheska. These girls cannot be more different from one another, since Winry has an obsession with mechanics and engineering and Sheska focuses on reading and, well, more reading. You might think, “hey, what do these girls have in common, anyway?" Though an unlikely pair, it completely works, since they amusingly feed into each other's goofiness but have the same drive to help people in need. They form a tremendously capable duo! YAY for besties. You can’t see it, but I’m shaking with excitement (and also from a teensy bit of caffeine) over this next one. Recently, I’ve been playing Persona 5 and have found that I’m only slightly addicted. Okay, okay, so I’ve been playing it fairly frequently and because of that, I’ve come to care for the characters and acknowledge how important friendship is to the game (just like past Persona games). Throughout Persona 5, you must pay attention to what’s called the confidant system, which is a social link level system between the main character and another character in game. As your friendship with another person grows stronger, you’re able to gain more abilities, items, and bonuses. Besides this gameplay aspect, it was also interesting to see how the characters interact with one another, both in cutscenes and battles. What’s even more amazing is that throughout the game the importance of friendship is cherished and put far above most things. In fact, at the end of the game, in order to get a “good” ending, the player MUST choose not to spill any information about his friends. It feeds into the whole concept behind Persona, that you're connecting with not only people in the world but, most importantly, your team. So, this goes for all Rick Riordan’s series, but the most recent one I’m on is Trials of Apollo. Of course, we have to acknowledge Percy, Annabeth and the rest of the characters' friendships. That’s a given. However, I do want to touch on Apollo and his evolution from self-absorbed god to only slightly less self-absorbed god. The premise of Trials is that Apollo, the god of the sun/prophecy/medicine/music/etc. (he’s in control of a LOT! ), is sentenced to live as a mortal until he can prove he is worthy to come back to Olympus. Zeus commands that the first mortal Apollo sees shall be his master (turns out to be a girl named Meg), who will have absolute control over him. Now, you’re probably thinking: wait, this doesn’t sound like fun and most certainly doesn't sound like the beginning of a friendship. This sounds...like the opposite of that. Oh, ho! But the story progresses and you watch as a burning hatred between Apollo and Meg blossoms into something more. I won’t dare step into spoiler territory, but I will say that there is one specific feels moment between Meg and Apollo in the second book that made me want to die from complete and utter sweetness. We’re talking full on sugar coma, people! It’s refreshing to see the great god Apollo develop modesty, kindness, and consideration all thanks to a little girl's friendship. I’ve recently finished Jessica Jones (I'm watching all the Marvel series at the moment) and found it was fascinating because it was packed with complicated human feelings, artsy noir vibes, and true to life consequences. That’s why Jessica and her best friend Trish's friendship was so treasured for me, because it was bright and white hot and created the perfect light to brighten the darkness of the show, especially near the end. Jessica is about to take out Kilgrave once and for all, so she must pretend that she’s under his control to fool Kilgrave. Prior to this, Jesssica has said that she doesn’t say I love you. So, when Kilgrave compels her to say just that, instead of turning to him and telling him what he wants to hear, she locks eyes with Trish and says "I love you" to her instead. Of course, there are many more instances of lovely friendships (Harry Potter, Kingdom Hearts, Voltron, Fire Emblem, and Totally Spies all demonstrate this), but fandom culture truly tends to highlight the importance of relationships of all kinds, most recently friendships. It's refreshing to see that bromances and galentines are definitely a thing. Let's keep it that way! What's your favorite fandom friendship?